Baseball cards came of age in the 1950s. They went from being largely a premium intended to help drive sales of candy to a standalone product. Collectors look back fondly on the 1950s. It's a golden era where several iconic players made their mainstream cardboard debuts. Mickey Mantle, Roberto Clemente, Hank Aaron, Willie Mays and Sandy Koufax are just a couple of the baseball players to have rookie cards in the 1950s. The early part of the 1950s saw Bowman and Topps duke it out for baseball card supremacy. This led to many great sets, both in design and checklist strength. By the end of the decade, Topps had emerged the victor and their standing in the hobby went virtually uncontested for more than 20 years. Below is a list of the top 10 baseball rookie cards released in the 1950s. While the list is largely based on value, it also takes hobby status into account. Some cards hold stronger values because they come from a certain set or they're a short print. A list of the best rookie cards from the 1950s has to take more than that into account. It's an iconic era so the cards must be iconic as well. Limiting ourselves to just 10 cards meant some hard cuts (Brooks Robinson, Frank Robinson and Harmon Killebrew come to mind). However, these 10 cards provide a balance of being both iconic and valuable. One of the greatest pitchers of all-time, Bob Gibson is also one of the game's most beloved players. 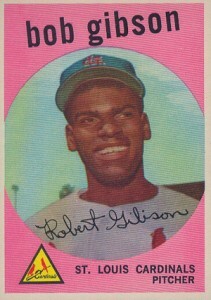 The 1959 Topps Bob Gibson rookie card features the young hurler in his trademark Cardinals gear. However, it's the infectious smile that really stands out. 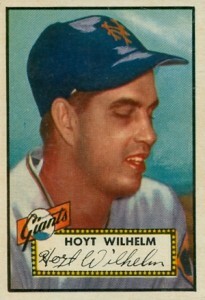 If this were a beauty contest, the 1952 Topps Hoyt Wilhelm wouldn't have been under consideration. Quite simply, it's an ugly card. But it's also a high-number short print in, according to many, the most important baseball card sets ever. Pitching until he was nearly 50-years-old, Wilhelm finished with a career Earned Run Average of just 2.52. Wilhelm played for ten teams in his career. He was elected to Cooperstown in 1985. 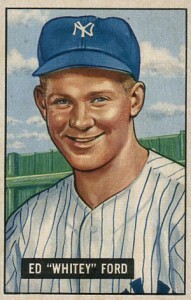 Like Wilhelm, outside factors contribute to the inclusion of the 1951 Bowman Whitey Ford rookie card over the likes of Harmon Killebrew and Brooks Robinson. Ford is one of the greatest pitchers in the history of the Yankees. The Hall of Famer spent his entire career in New York, winning six World Series Championships. Despite how good Ford was on the field, there's another big reason why this card is so valuable today. It's as simple as the number on the back of the card. Ford is the first card in the important 1951 Bowman Baseball set. First cards from this era often carry a significant premium because they'd be on the top of stacks and take the brunt of the punishment as cards were played with and shoved in pockets. 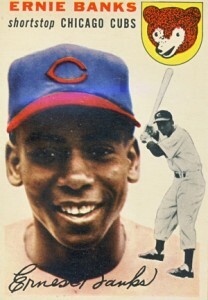 The 1954 Topps Ernie Banks rookie is one of the most instantly recognizable baseball cards of all-time. The dual-photo design is a classic. Banks' beaming smile catches your eye instantly, bringing out a joy seldom seen on baseball cards. One of the most beloved, if not the most beloved, member of the Chicago Cubs, Banks was a 14-time All-Star and two-time National League MVP. The list of accolades surrounding Sandy Koufax are some of the most impressive ever amassed in the game. Although some of his career numbers may not reflect it, that's because Koufax was out of the game at the age of 30. Spending his entire career with the Dodgers, Koufax won three Cy Young Awards, an NL MVP and four World Series. He also pitched four no-hitters. 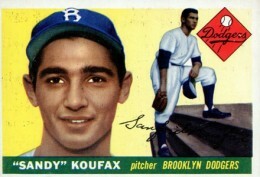 The 1955 Topps Sandy Koufax rookie card is bright, bold and instantly recognizable. As history looks back fondly on Koufax, this card continues to draw tremendous attention among multiple generations of collectors. There's no denying that Eddie Mathews was a great hitter. Enshrined in the Hall of Fame, he hit 512 career home runs. But a top-5 rookie card, ranked higher than the likes of Koufax and Banks. It's debatable, for sure, but as the final card in the short-printed 1952 Topps Baseball High Series set, this about more than being just the Eddie Matthews rookie card. As the last card, it was often relegated to the bottom of stacks where it would take a lot handling. 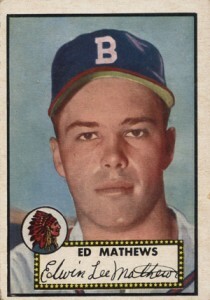 Today, the 1952 Topps Eddie Mathews rookie is fairly tough to find and even low-grade cards sell for four figures. Hank Aaron spent decades as baseball's all-time home run king. In light of the controversy surrounding Barry Bonds, many still view Aaron as the deserving king. 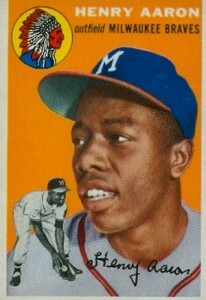 Either way, the 1954 Topps Hank Aaron rookie is one of the best baseball cards ever made. It's engrained in the mind's of collectors and remains a top choice of anyone chasing 1950s rookie cards. Like every card on this list, it's the stories that follow the player that help make these rookie cards so iconic and memorable. 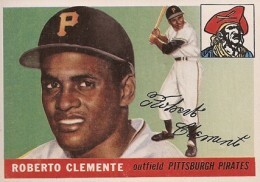 Few players are remembered as fondly as Roberto Clemente. A fierce competitor, his life was cut short when a plane he was on crashed as he was delivering relief supplies to Nicaragua. Sharing the 1955 Topps Baseball checklist with Sandy Koufax, it's one of the hobby's greatest one-two rookie card punches. Few will debate Willie Mays' place in baseball history other than exactly where he belongs on the "Top 10 Position Players of All-Time" list. 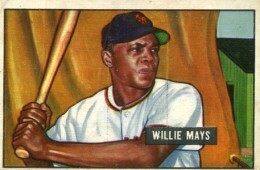 The 1951 Bowman Willie Mays rookie features the classic illustrations found throughout the set. The card is one of best baseball cards the hobby has ever seen, not just from those produced in the 1950s. Perhaps you were expecting a different Mickey Mantle "rookie?" 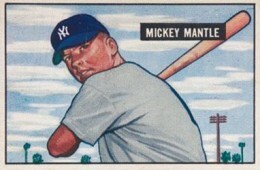 There's a common misconception that the 1952 Topps Mickey Mantle is his rookie card. But it's not. The 1951 Bowman Mickey Mantle came out a year earlier. And it's gorgeous. The painted horizontal card captures the slugger's youth. Even if it's not as recognizable (or as valuable) as the 1952 Topps Mickey Mantle card, it captures the romantic nostalgia of decade. 1954 TOPPS # 239 BILL SKOWRON ROOKIE !! The 1959 Topps Bob Gibson is one of my favorite 50’s rookie cards. The card is ironic because Bob was known for intimidating batters by grimly staring them down and backing them off the plate. However, he is smiling in this pic and featured on a PINK card of all colors. There comes the irony!